Making up some BXA toolholders. Before I have cut the dovetail with a homemade tool using tnmg insert, it works but it hammers being a single cutter. 1 3/8" cutter diameter, 5'8 shank, 9/16" cutter Width. Any thoughts on if I can get buy with the smaller, less expensive one, or should I go with the 1 3/8" model. I predict you will have chatter troubles with the smaller cutter. A 3/8" shank is awfully wimpy for the width of cut involved. If you have access to a shaper, use that and save your cutter money for a rainy day. Think hard about how you will gage the dovetail before starting. It's not so easy, because the faces that need measuring are the slanted flanks and the *outside* faces, rather than the bottom of the slot. Simply measuring over dowels won't work, because they rest on the bottom of the slot, which is not necessarily a precision surface. That approach will work if you are first careful to get the slot depth correct. Do you have a nice-fitting BXA block to use as a master? I am also in the middle of making some BXA holders. This time I am using a 3 insert dovetail cutter I made using TDEX (I think) inserts, like the ones used in Dorion tool cutter. 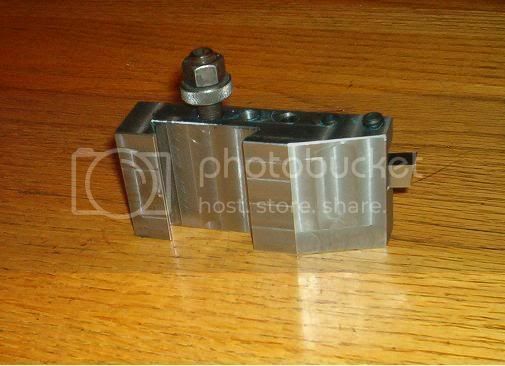 I made a batch of holders using a dovetail cutter like you are describing, and it did "hammer" but it got the job done. 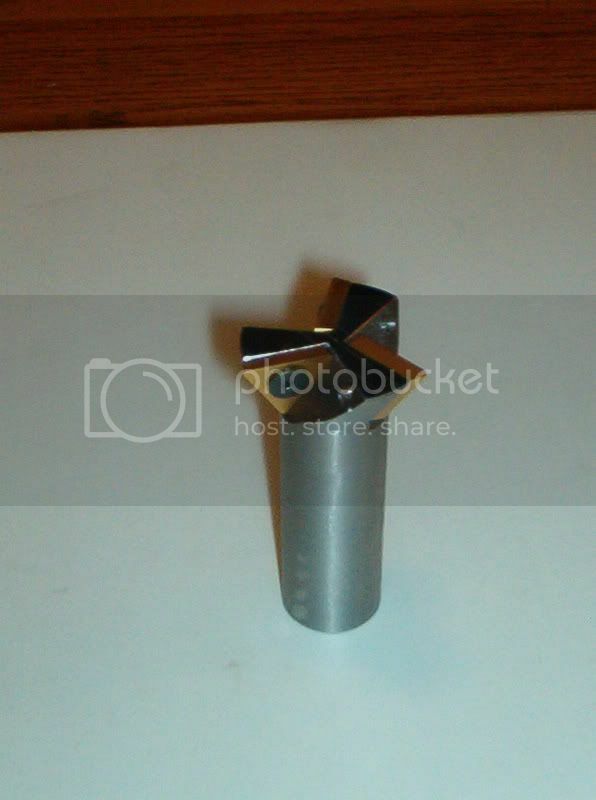 Is the cutting edge of the insert above the center line of the holder? How much does the insert protrude from the insert? One tip I learned last time was to make the dovetail a little tight, and then remove small cuts from the contact face to get the handle on the tool post to line up at the 5:00 position. seemed like .001" would move the handle 10* or so. Are the sides of the triangular inserts really straight enough for dovetail work? inserts are plenty straight for this work. Thanks for the input guys. No shaper access, so I will make them. On my homemade holder I made the mistake of having insert cutting edge above center. What a rookie mistake, that probably accounts for a portion of the chatter. After seeing Pete's holder I may try making another one this weekend. I just picked up a small shaper just to try dovetails. I have a ton of cxa size holders but I need some QITP25 size holders. I was thinking of making them of 7050 or leaded steel. Since I have never used a shaper, I'm sure the project will be an education. Thanks for the plug that's my website. Michael did you mean to say TNMG? That's a neutral rake insert i.e. the edge is square to the face, so there's no relief to clear the cut when used as a milling cutter. That is, unless you move it forward of the centerline, in which case it isn't cutting a 60 degree angle. The plane of the cutter face must go through the axis in order for a 60 deg cutter to actually cut a 60 deg angle. Yes, I did build my cutter with TNMG. Geez, its amazing it worked as well as it did. The toolholders I made fit well and the handle of toolpost is in 5 oclock position. Guess the lame get lucky sometimes. I will hunt down some of the TCMM inserts. I just finished cutting the dovetails on 3 new holders. I should be able to finish them tomorrow. OTOH, as far as the original question, if the 3/8 shank x 3/4" cutter has a face width adequate to the job, it will work fine. 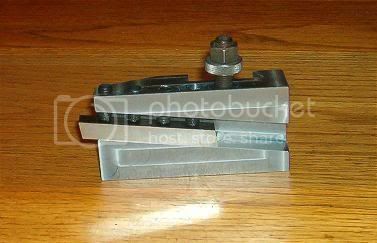 I have and used to use, a lot of dovetail cutters. 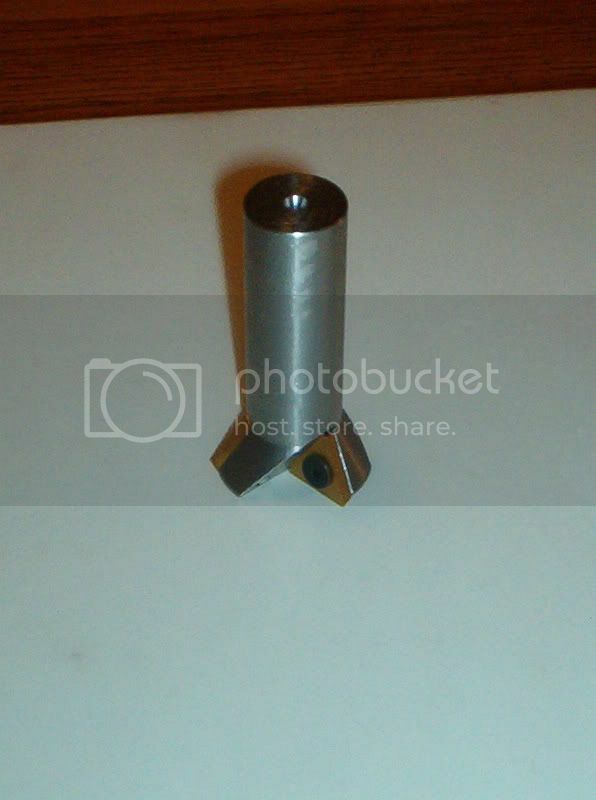 The 3/8" shank is buried in a normal R8 solid socket (EM holder). So the shank is supported right down to the top of the cutting edge by the holder. The smaller diameter cuts more freely in lower HP and less rigid mills. The 3/8" socket is shorter and projects less, so from the spindle out, the 3/8 shank offers more rigidity than the 5/8 in a 5/8" socket. These cutters go defunct in two primary ways: 1.) Too heavy a cut for the spindle, chatter, and break the corners off the teeth. 2.) use a larger cutter than necessary to use a supposedly more rigid shank, hence wear out the bottom half of the teeth using them to make shallow dovetails. Here are a couple of pictures of my efforts. These tool holders have an extended nose for increased clearance, and the tool bit sits at 7* so I only have to grind the front and side, and top clearances. The back rake is taken care of by the 7* angle. Nice holder. Why not take it a step further and put the side angle in the slot, then only the side clearance and nose angle have to be ground? I made a reversible shaper tool holder that way a number of years ago, and it is handy for side cutting work where the toolhead is fed down (on the shaper). By reversible, the holder is a flat piece of barstock, with the same side angle on each end. So turned one end down, it is right cutting, the other end left cutting. Nice - very nice. I have been dovetailing a bunch of 1" and 1 1/4 inch shank tooling over the last few months, used HSS dovetail cutters with 1/2 shank, worked well. I cheated a bit by actually undercutting the dovetail in a bit with an old carbide keyway cutter to clear out material as much as possible in the dovetail area, leaving as little stock as possible for the dovetail cutter. I really need to break down and get a real carbide insert cutter for this job if I keep at it. Dowel pins and a go no go gauge block set up helped me do this right with my students, who were giev one 1 1/4 tool each to learn dovetail cutting. Actually, true Aloris holders are not cheap to buy at all. You can buy Chinese knockoffs pretty cheap but not the Aloris holders. Also you can make several at a time for a piece of steel about the price of two or three of the Chinese knock offs. If you have lots of money to donate to the Chinese economy, that's cool too. It's all good. Thanks Daren. I see the one fella that made a cutter, had used 60 degree inserts. The only problem I see there is your insert would cut the whole bottom as well as the whole side on the cut. I am not real familiar with all the variety of inserts but, I would think it better if the insert were say 45 degree so you would cut with the side but the bottom would only cut on the tip. I wonder if they make inserts between the 45 and 60 degree? I don't know if it is a big deal or not. Yes it wasn't a very good design, I was just trying to use what I had to hand. I have some smaller tips on the way so will have another go and hopefully will make a better job of the next try. I finished my tool holder by the way. Very pleased with the outcome..!